My mom grows concord grapes in her backyard. Growing up we would juice them together each year. 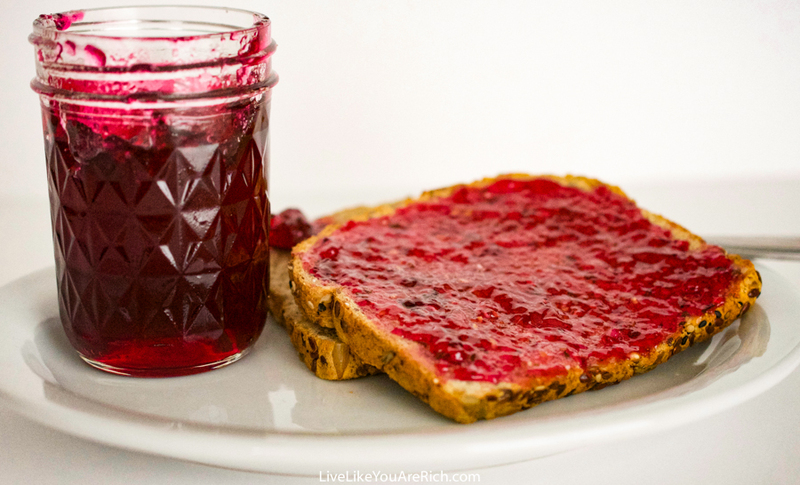 She would then make a few dozen batches of delicious grape jelly from her homemade grape juice (post here). This is my favorite jelly! It is so flavorful, sweet, and delicious! It is easy and quick to make, especially considering the fact that the extras will store for up to a year. I’d highly recommend trying this fantastic recipe. Begin by sanitizing the lids and jars. Simmer them in boiling water for at least 10 minutes. Juice two lemons. 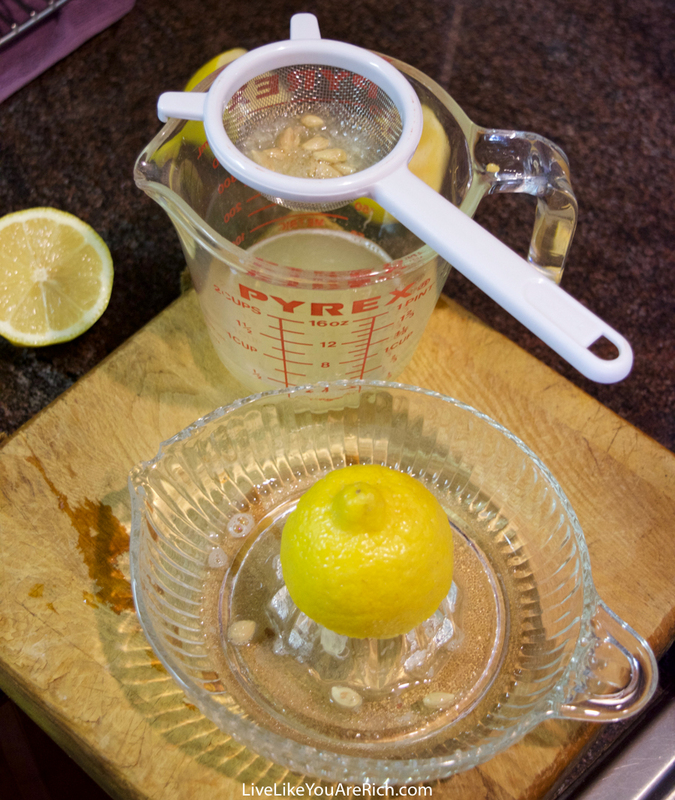 Strain the lemon juice to remove pulp and seeds. 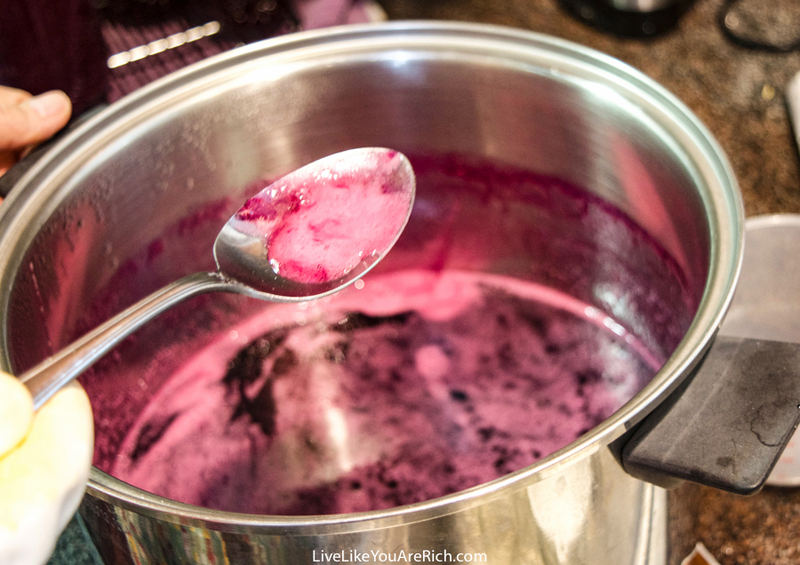 Combine 1/4 Cup lemon juice, 1 Cup water, and 2 Cups grape juice into a 6 or 8 Quart saucepan. Measure the exact amount of 5 1/3 Cups sugar. Pour it into a separate bowl. Stir 1 pkg. of MCP Premium Fruit Pectin into the juice in the saucepan. Optional: add 1/2 tsp. of butter or margarine to reduce foaming—we didn’t add butter. Bring the liquid mixture to a full rolling boil (a boil that doesn’t stop bubbling when stirred) on high heat, stirring constantly. Add sugar to liquid mixture in saucepan. Return to a full rolling boil for 2 minutes, stirring constantly. Remove from heat. Skim off any foam with a metal spoon. Ladle or funnel immediately into prepared jars, filling each to within 1/4 inch of top. Wipe jar rims and threads and cover with two-piece lids. 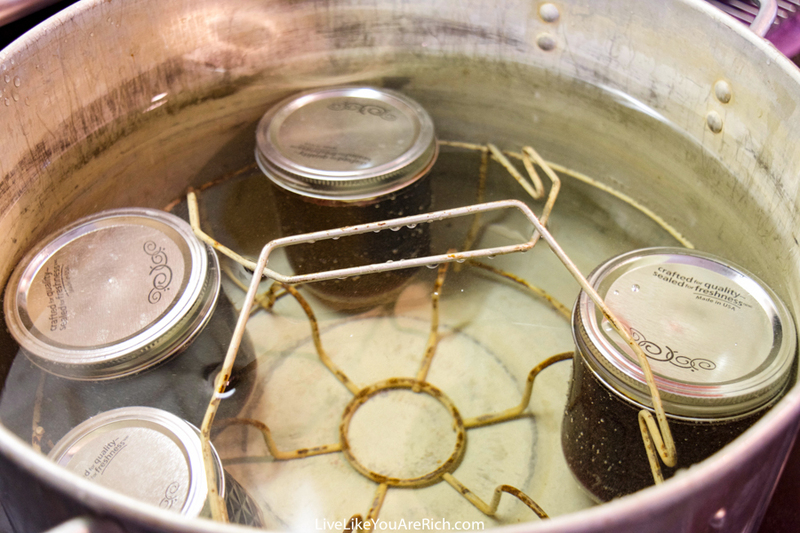 Finally, you need to seal the jars by putting them into a waterbath canner. 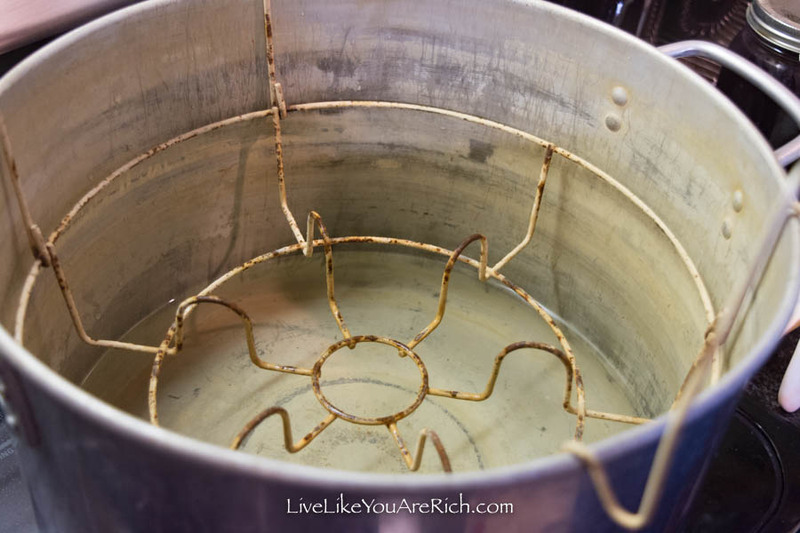 This will seal the lids tight to avoid fermentation. Place jars on elevated rack in canner. Lower rack into canner. Water must cover jars by 1 to 2 inches. Add boiling water if needed. 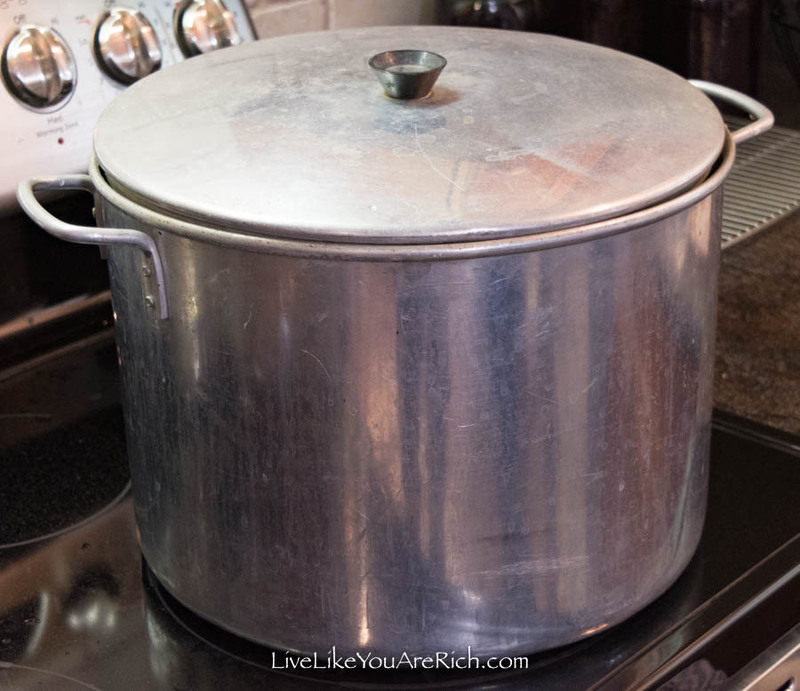 Place the lid on the hot water canner and turn the stove to high heat. Remove jars and place them upright on a towel or cooling rack to cool completely. 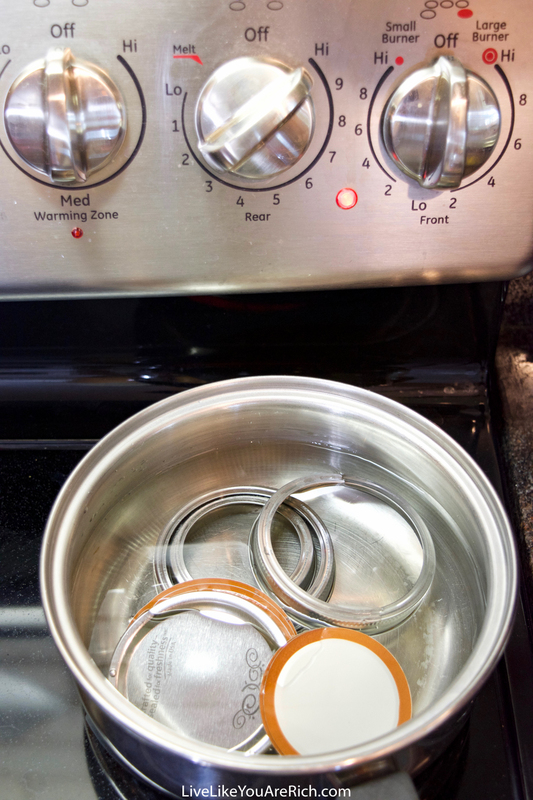 After jars cool, check seals by pressing centers of lids with finger. If lid springs back the jar is not sealed and refrigeration is necessary. Let prepared jars stand at room temperature for 24 hours. Store unopened jelly in cool, dry, dark place for up to 1 year. Refrigerate opened jellies up to 3 weeks. 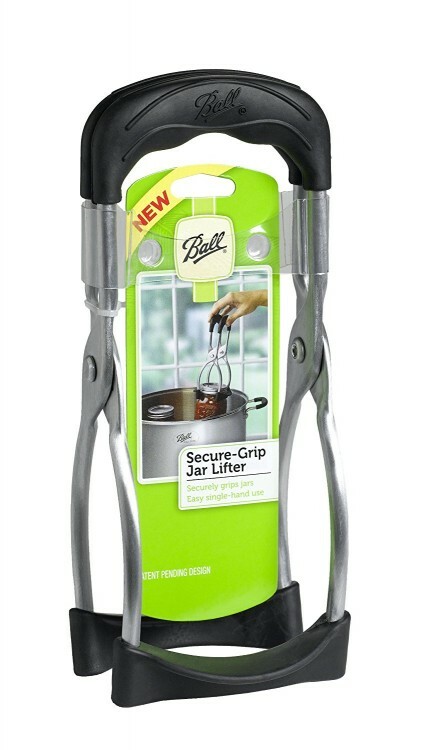 When ready to open a jar, carefully (so you are gripping the lid only and not the lip of the glass jar) use a church key to pop the sealed lid off. Serve on toast, rolls, etc. and Enjoy! My mom grows concord grapes in her backyard. Growing up we would juice them together each year. 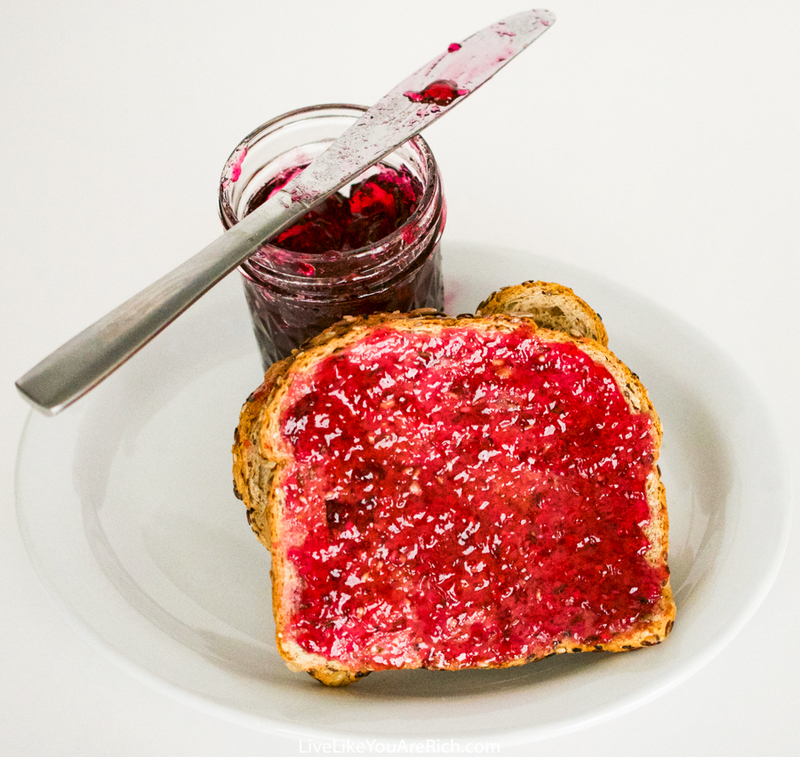 She would then make a few dozen batches of delicious grape jelly from her homemade grape juice. This is my favorite jelly! It is so flavorful, sweet, and delicious! It is easy and quick to make, especially considering the fact that the extras will store for up to a year. I’d highly recommend trying this fantastic recipe. 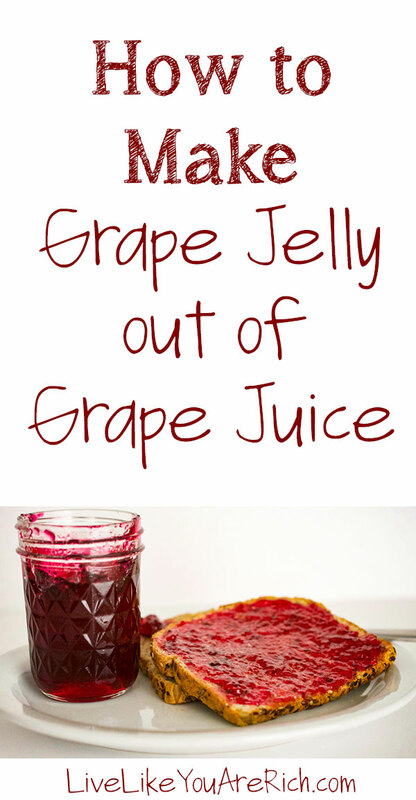 Combine ¼ Cup lemon juice, 1 Cup water and 2 Cups grape juice into a 6 or 8 Quart saucepan. 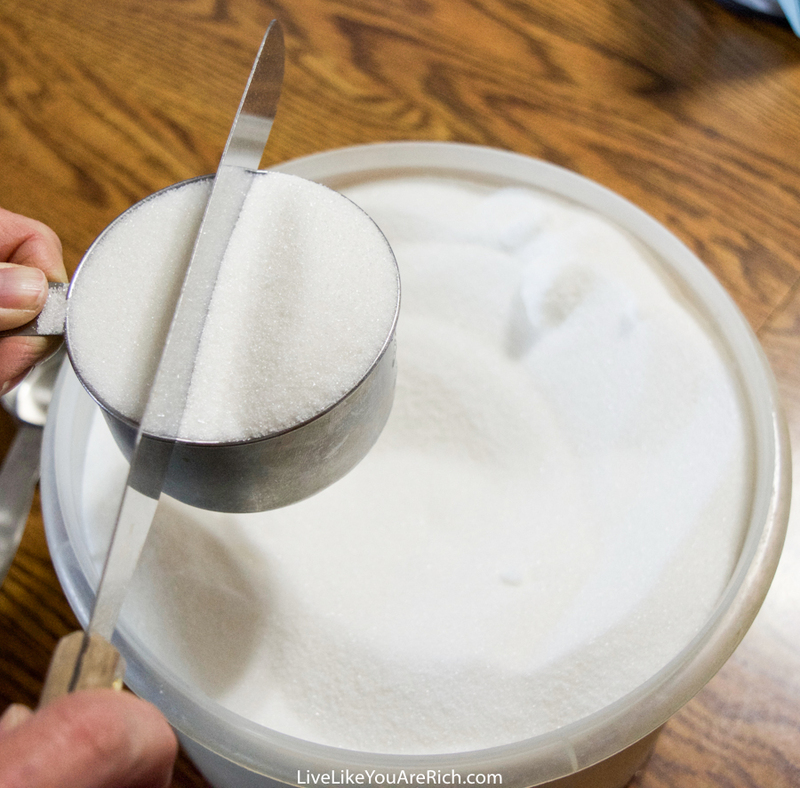 Measure exact amount of sugar into a separate bowl. Stir 1 pkg. 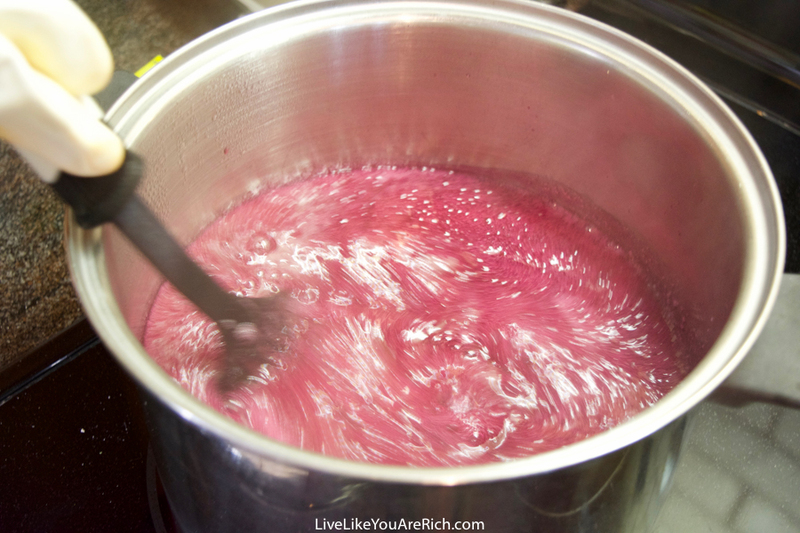 of MCP Premium Fruit Pectin into the juice in the saucepan (optional add ½ tsp. of butter or margarine to reduce foaming). We didn't add butter. Bring the liquid mixture to a full rolling boil (a boil that doesn't stop bubbling when stirred) on high heat, stirring constantly. Ladle immediately into prepared jars, filling each to within ¼ inch of top. Wipe jar rims and threads and cover with two-piece lids. Places jars on elevated rack in canner. Lower rack into canner. 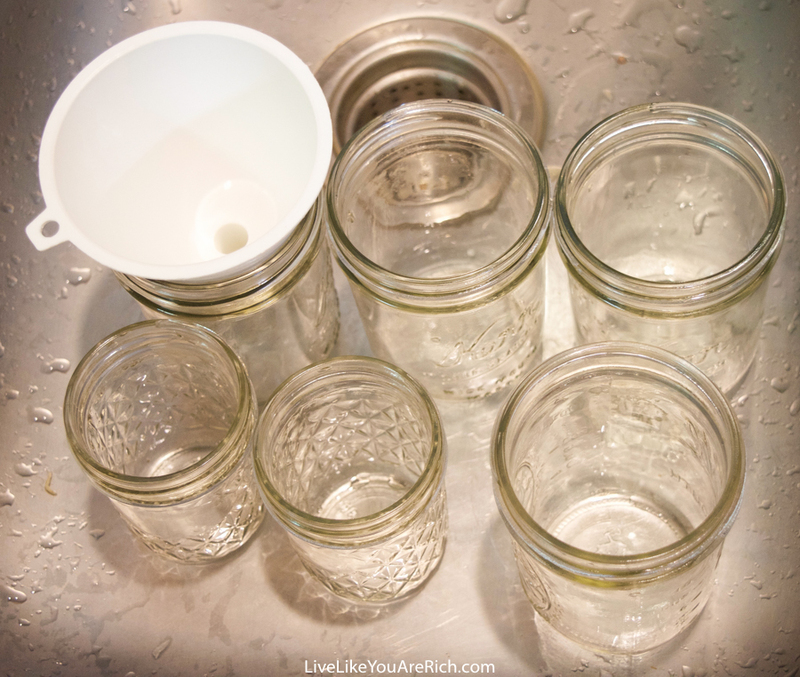 Water must cover jars by 1 to 2 inches. Add boiling water if needed. Cover; bring water to a gentle boil. Boil for 10 minutes. Remove jars and place upright on a towel to cool completely. After jars cool, check seals by pressing centers of lids with finger. If lid springs back the jar is not sealed and refrigeration is necessary. Let prepared jars stand at room temperature 24 hours. Store unopened jelly in cool, dry, dark place up to 1 year. Refrigerate opened jellies up to 3 weeks.